Engineers install wireless sensors to monitor the effects of vibration and strain on a highway bridge. Bridges and other highway structures age, crack, and weaken over time. They can deteriorate because of wear and tear from everyday traffic, weather events, and crashes. The Federal Highway Administration (FHWA) requires a visual inspection of bridges every two years.1 Inspections may not always provide a complete picture of structural conditions because the naked eye cannot detect internal changes or damage that occurs at a microscopic level. FHWA’s Exploratory Advanced Research (EAR) Program is supporting the following research to develop self-powered wireless sensors that can monitor structural health or assess bridge conditions. 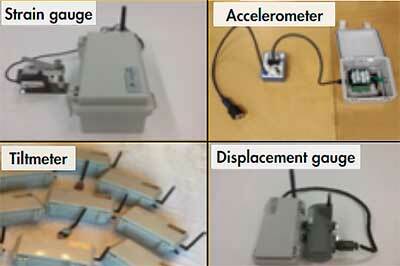 Michigan State University (MSU) is working on a project focused on structural health monitoring using wireless monitors. The project is called the “Ultra Low-Power Wireless Sensing System.” Washington University in St. Louis and the University of Southern California are collaborating with MSU on this project. Drexel University researchers are developing a suite of portable wireless sensors to provide important baseline data on structural health. These sensors can be installed as needed to assess damage from floods, accidents, or similar incidents that might compromise structural integrity. The Drexel research, “Multipurpose Wireless Sensors for Asset Management and Health Monitoring of Structures,” is being carried out in partnership with Smartsensys. More than 30 percent of existing bridges in the United States have exceeded their 50-year theoretical design life.2 Continuous, low-cost monitoring of the condition of bridges and other civil infrastructure systems could serve as an early warning system for serious structural damage. One of the chief obstacles to monitoring systems for damage detection in bridges is the high cost of installing enough sensors to provide high-resolution spatial data—this feature is key to capturing the spread and detection of small cracks, which can warn of more serious damage in the future. At MSU, EAR Program-supported researchers are developing wireless sensors to provide continuous and autonomous long-term monitoring of structural behavior. 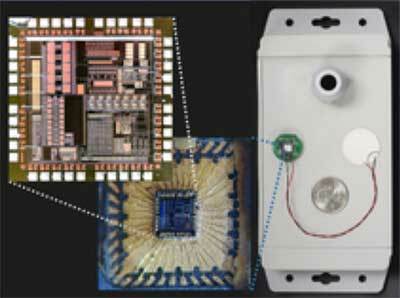 The MSU team’s novel monitoring approach is built on self-powered piezoelectric-floating-gate (PFG) sensors. The PFG devices do not require batteries; they use energy harvested directly from the structure itself. The piezoelectric materials convert strain induced by mechanical events into voltage. The PFG device counts and records the mechanical events with frequencies less than one cycle per second. The network of sensors detects the effect of each event locally and compresses and stores the data on the sensors as a histogram of cumulative events. This real-time processing significantly reduces the amount of data that must be transmitted and analyzed. Field trials of the PFG sensors have successfully analyzed multiple damage scenarios that include damage to gusset plates, steel frames, and girders. © 2017 Washington University in St. Louis. Prototype sensor board with PFG chipset inside 915 MHz telemetry box. Installation of sensors can be time consuming and can be costly in part because of the need for long cables that connect the sensors to data loggers. The Drexel researchers have developed a suite of portable, battery-powered, wireless sensors that can be rapidly deployed. Field tests are providing accurate structural measures in acceleration, strain, displacement, and tilt of structural components. The sensors can establish baseline measurements at the beginning of the bridge life cycle and then subsequently assess on a regular basis or as needed. They also respond to weather- or accident-related events to quickly and accurately document changes with respect to initial conditions. During one field test of the instruments, researchers deployed wireless strain and displacement gauges on a multispan bridge where motorists had reported high levels of vibration. The wireless instruments provided measurements with accuracies comparable to those recorded by state-of-the-art wired sensors. Installation times and associated costs were significantly reduced, compared with previous methods. The Drexel team performed a second field test on a multispan steel bridge crossing the Delaware River. The team used data collected by wireless accelerometers to extract vibration properties (mode-shapes and frequencies) and calibrate a numerical model of the structure. Magnetically-mounted strain gauge, accelerometer, tilt sensor, and displacement sensor converted for battery-powered wireless operation. The EAR Program addresses the need for longer term, higher risk research with the potential for long-term improvements to transportation systems—improvements in planning, building, renewing, and operating safe, congestion-free, and environmentally sound transportation facilities. The EAR Program seeks to leverage advances in science and engineering that could lead to breakthroughs for critical, current, and emerging issues in highway transportation—where there is a community of experts from different disciplines who likely have the talent and interest in researching solutions and who likely would not do so without EAR Program funding. To learn more about the EAR Program, visit www.fhwa.dot.gov/advancedresearch. The Web site features information on research solicitations, updates on ongoing research, links to published materials, summaries of past EAR Program events, and details on upcoming events. For more information about the wireless sensor research projects, contact Fred Faridazar, 202-493-3076 (email fred.faridazar@dot.gov). 1 GPO. (2011). Subpart C—National Bridge Inspection Standards, 264 §650.307 23 CFR Ch. I, Sec. 209, Construction, (4–1–11 Edition), Government Printing Office, Washington, DC, obtained from https://www.gpo.gov/fdsys/pkg/CFR-2011-title23-vol1/pdf/CFR-2011-title23-vol1-part650-subpartC.pdf, last accessed June 20, 2017. 2 U.S. Department of Transportation. 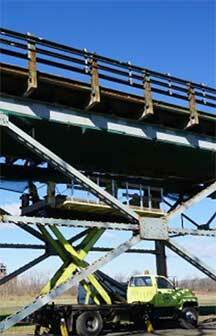 Bridge Preservation Guide: Maintaining a State of Good Repair Using Cost Effective Investment Strategies. Publication No. FHWA-HIF-11-042.